The hopback was purchased from P.B.S. for $85. The hopback is made from a Vollrath 1 ¼ quart stainless steel bain marie. The handle of the lid is cut off. 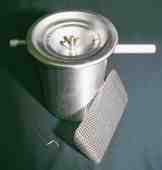 A stainless steel threaded rod is welded to the bottom of the bain marie and extends through a hole in the lid. The lid is secured with a rubber washer and wing nut. The lid has a rubber O-ring which forms a seal with the container. The hop screen is a stainless steel sheet with what appears to be a 3/32" diameter on 5/32" center hole pattern. The sheet is bent and rounded to match the contour of the inside wall of the bain marie. A piece of spring steel holds the hop screen in place. The inlet is a piece of ½" O.D. stainless steel tubing which is bent at a 90º angle to deliver the wort to the bottom of the bain marie. The outlet is a piece of ½" O.D. stainless steel tubing which exits the bain marie at 180º from the inlet. The P.B.S. literature suggests there is "No loss of height between the kettle drain & line out of hopback". The "line out" of my hopback is ¼" higher than the "line in". And while this may not seem like much, ¼" of an 18" 15 gallon pot is over 1/5 of a gallon. The P.B.S. literature also seems to stress that you shouldn't over tighten the wing nut which holds the lid in place. I'm sure it's rather easy to tear the threaded rod from the weld in the bottom of the bain marie. I have only recently integrated the hopback into my brewing system. In its few trials, it has worked surprisingly well. The bain marie (7-L-858, $12) and lid (7-L-872, $7) can be purchased from Superior Products. I've included these prices not to suggest that you build your own, but to begin to justify the $85 price tag. Stainless steel is very expensive, as is stainless steel welding. I think the P.B.S. hopback is well worth the price.